Smallest order is for 10 units. Order in multiples of 10. Solid polycarbonate for strength with flat end. Molded grooves to ensure a good grip. 5.5 inches long(before the keyrings). Comes with swivel and keyring. Recommended by many self defense professionals. 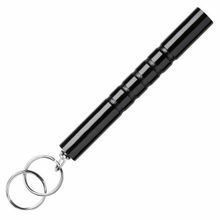 Add this simple and inexpensive item to your keyring to enhance you ability to inflict damage on your attacker and protect yourself. Can be used to strike directly to face and boney areas, apply pressure to nerve points and also as a grip to use keys as a flail. Minimum order is for 10 units. Exactly what I wanted. Easy way to always have keys handy, I stow them in the back of my jean, cover them with my shirt. Beats digging thru my purse or backpack.